Continually changing range of 4 or more ales. If you're comming from the A12 then after climbing the hill, passing the radio mast on your left then starting a descent, you come to the junction with the B 1022. 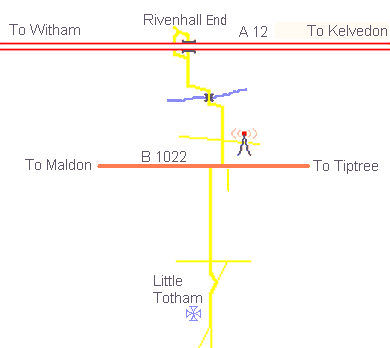 You must do the right-then-left dog leg to get onto the Little Totham Road. Standard pub food. Every day 12 - 2:30. NB Book Sunday roast by Thursday. Adnams is served fresh by popular demand to suit the taste of those who like their Adnams to taste like it tastes at Southwold. (If on the otherhand you prefer well matured Adnams try the Blue Boar in Maldon.) Other beers are left a decent time in the cellar before being sold. Children welcome with well behaved parents until 9pm. Essex CAMRA pub of the year 1999.